Last week, Toyota’s luxury arm pulled back the curtains on the 2016 Lexus ES, which made its world debut at Auto Shanghai 2015 alongside the RX 200t luxury utility vehicle. The all-new ES has received a new powerplant and safety system, but as a luxury vehicle, its most intriguing updates include its new design, inside and out. On the outside, the 2016 Lexus ES gets a new front fascia featuring the trademark spindle grille and adorned in satin chrome. But it’s the new headlights with LED projector technology that command the attention as far as the face of the ES goes. The entire body is sleek with a “graceful roofline” that is all about continuous flow. The rear gets new taillights, though they, like the headlights, maintain the signature L-shape that Lexuses are known for. Lexus has also added four new colors: Amber, Caviar, Eminent White Pearl, and Nightfall Mica. Inside, the Lexus ES is defined by its ultimate blend of comfort and luxury, working together to exude a confidence that no luxury interior can match. 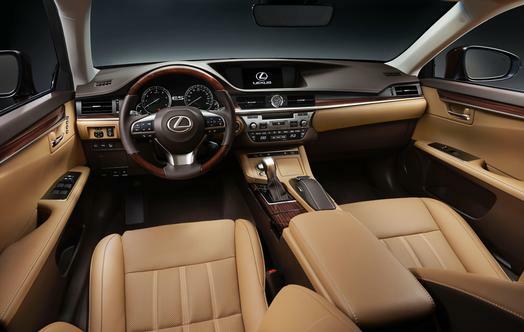 Customers get their choice of four seat colors—Black, Flaxen, Parchment, and Stratus Gray—and three trim materials—semi-aniline leather, leather, and Lexus NuLuxe. There are also four styles of interior trim: Bamboo with matte finish, Espresso Bird’s Eye Maple (we have no idea what that means) with Shimamoku ornamentation, Illustrious Piano Black, and Linear Dark Mocha Wood. Customers will also appreciate an updated steering wheel for a more engaging drive. New for 2016 is a 2.0-liter direct-injection four-cylinder engine, to be offered in China, Russia, and Taiwan. Here in the States, the ES will keep its 3.5-liter V6 and the hybrid powerplant. Even more exciting, the 2016 Lexus ES comes with the new Lexus Safety System +, which packs in a number of safety technologies all together. Included are the Pre-Collision System, Lane Departure Alert, Brake Assist, Automatic High Beam, Radar Cruise Control, and more.